Dustin mentioned that you can see the Semantic Web Meetup site for the slides. The first session I attended was led by Quinn, the 9 year old daughter of Andy Lester. She showed us how to make a pen and some duct tape into a flower. So in a room of 9 adults, none of us could make one as awesome as hers. 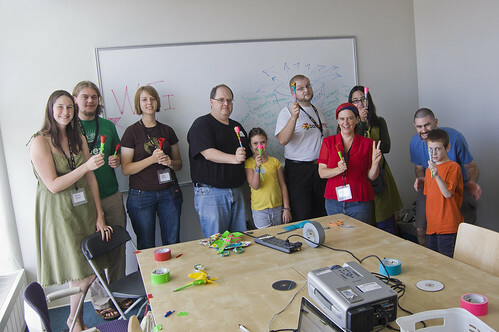 This was a fun session, and would be perfect for KidsCamp at BarCampMilwaukee6. Hmmm, I don’t know that I can review this session, as I was the one who led it. 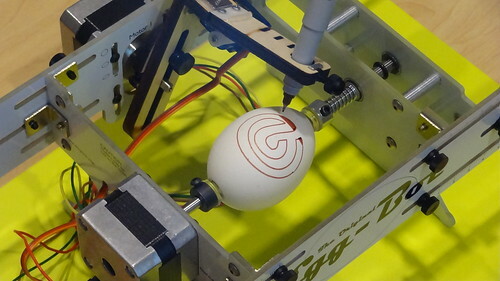 I basically gave an Egg-Bot demo, and talked about what it does, and what I’ve learned, and showed some designs I’ve printed, and I threw some eggs. I then attempted to print a Bendyworks logo, and an Athmapolis logo. I guess this session went well, people seemed interested, but hey, who doesn’t love an Egg-Bot!? 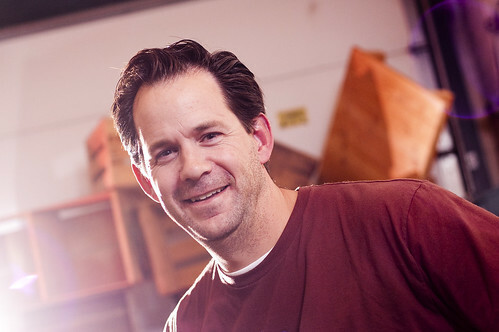 I got to know Jason earlier this year, and he may be Beaver Dam’s most prolific maker. (But hey, it’s Beaver Dam.) 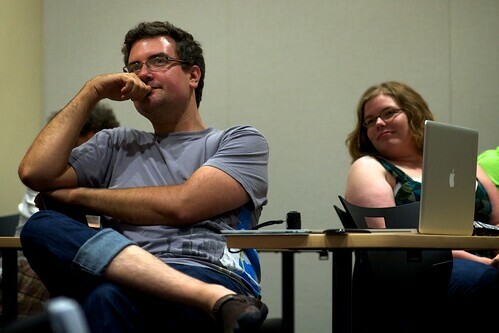 Anyway, I think I helped convince him to attend, and even lead a session at his first BarCamp. He walked us through building a CNC laser device out of scrap (mostly old CD/DVD drives) and some parts that had to be bought. Great session! I love hearing makers talk about their projects. This one was interesting. It was so interesting I left the Twilio session (sorry Greg!) because I was pulled in by what I was hearing. My disclaimer: I’m a member of Milwaukee Makerspace, but I am not an officer, or a founder, or in charge of anything. Anyway, the Sector67 guys led this, and talked about how they run their space. I brought up a few points about how Milwaukee Makerspace does things (or at least how I understand they are done) and I sort of felt like there was a little tension about the differences between how the two places operate. In talking to other later, people were not surprised, stating that almost every space will operate differently, and often one space will thing they are doing it exactly the right way. 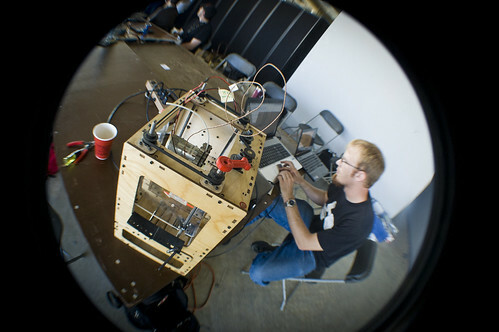 :) I’m really hoping that at BarCampMilwaukee6 we can have a talk with people from Milwaukee Makerspace, Sector67, Pumping Station: One, and Twin Cities Maker, since all groups will have people present. I should probably propose this to all of those folks. It could be a great learning experience. This one was simply awesome. I’ve been in love with the MakerBot for some time now, and wanted more info. 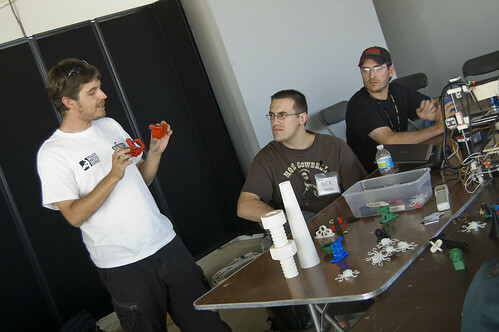 Joe from Sector67 gave a great overview of 3D printing, and also talked about (and had present) a RepRap machine. We saw a bunch of samples that had been printed, and at some point Chris did get the MakerBot talking to the laptop he had and we got some printing done. It sounds like Joe and at least one printer might also make it to BarCampMilwaukee6 as well, so get ready for more 3D printing fun. So that was MadCamp (aka BarCampMadison the 4th.) I enjoyed it, and I await the next one. In the meantime, BarCampMilwaukee6 is coming up soooooon. First off, I will shout out a big thanks to Greg Tracy, Phillip Crawford, Steve Faulkner, and anyone else who helped organize the event and made it happen. Urban Land Interests provided space in the US Bank Building right on the Capitol Square in Madison. It’s easy to get to, you can park around the corner all day for $3, and there’s an amazing view of the Capital. That’s the good stuff… the not as good stuff is that the sessions were spread out among 3 floors. The ground floor lobby served as the common area, with 2 session rooms, and there were 2 more session rooms on the 8th floor (in the Murfie office) and 2 more on the 9th floor (which was the main area for BarCampMadison3.) But hey, thanks to Twilio and Greg’s MadCamp Notifier, there was a bit of assistance with session notification. As usual, I brought too much crap, including The Photo Booth (photos are here) and the latest revision of the Time Lapse Bot (video to come) and I brought A/V equipment, much of which failed during the event. Still, I managed to record a few sessions. For each BarCampMilwaukee, we’ve always had Introductions, where each person says who they are, what they are interested in, etc. Last year we gave people about 20 seconds to do their intro, and timed it. (You can watch it here, btw.) For MadCamp, there were no intros. 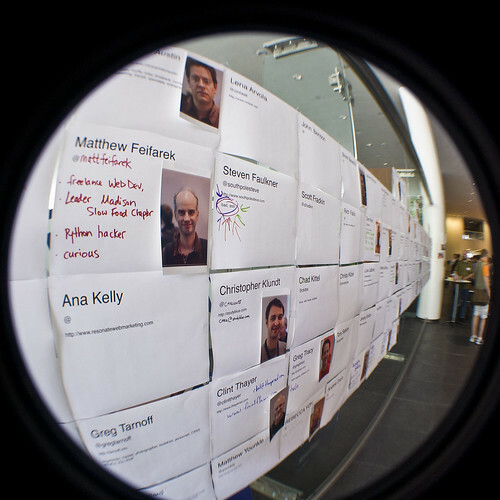 but instead they created a Camper Wall, which worked like this: When you registered, you got your photo taken, which was then printed on a photo printer, and then attached to a printout on the wall with your info. It was cool to be able to browse the wall and see the people there, and be able to find them easily. Using a photo from that day was brilliant. I love avatars and 5 year old head-shots as much as the next geek, but seeing a recent (that day!) photo on the wall made it easy to identify people. Still, I really am a fan of having everyone introduce themselves. 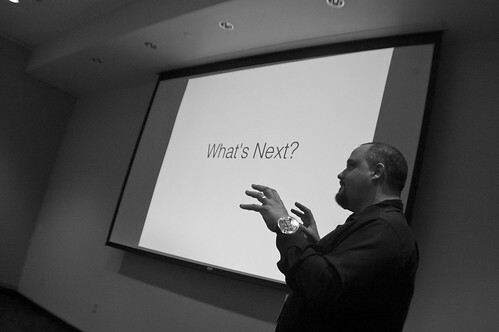 In Part 2 you can read about the sessions I attended: MadCamp ReCap: Sessions.